Roll dough to 1/4 inch thick. Cut with large 6-8 inch gingerbread men cookie cutters. Lift onto lightly greased cookie sheet with broad spatula. Bake above oven center for about 12 minutes or until cookies spring back lightly in center. Do not overcook, they won't stay soft. Remove from sheets. Cool on wire racks. Makes 10 men 6-8 inches tall. See how to make easy 5-star gingerbread cookies. 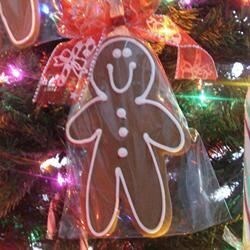 I have tried many gingerbread boy recipes and these were so easy to prepare and had a delicious flavor. Dough was a little dry to work with after chilled. Kneading it in the hands warms and softens it, though it's still a bit crumbly when rolled out. Tastes great, makes nice soft cookies.